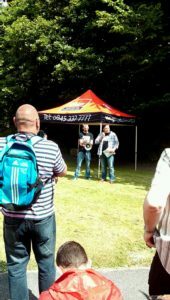 GMB R75 branch attended a rally in solidarity over a dispute over bullying, pay and welfare facilities of members at Green Co started a year ago so event marks one year of this dispute which is still not resolved says GMB. 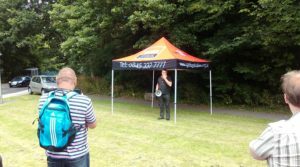 GMB organised a rally in Sheffield on Saturday July 18th to mark one year of the dispute involving the Green Co recycling workers. This is supported by the regional TUC. See notes to editors for copy of one of the GMB press releases issued during the dispute. Reinstatement of the sacked reps. Reinstatement of the sacked managers who blew the whistle and challenged bad practices from the outset. The living wage, our stolen bonus and allowances back. Zero hours contracts to be ended. A service run for Sheffield and not for personal gain. Peter Davies, GMB Organiser in Sheffield, said “The bullying of our members at Green Co started a year ago triggering this dispute. The event marks one year since this dispute over bullying, pay and welfare facilities began.
. We suspended strike action last December to give Sheffield City Council and Veolia an opportunity to intervene. Since the dispute began the entire senior management team that used to run Green Co have been sacked along with the GMB reps. An Independent investigations into the many issues of dispute is still underway and is expected to conclude in the coming days and weeks. At Easter our members attempted to go on strike again, frustrated with the length of time it is taking to get any sort of intervention into the way this awful company operates in Sheffield. Despite this legitimate and fully lawful industrial action notice however, the company wrote to every GMB member and threatened them with the sack if they went ahead. Companies like Green Co have no regard for the rights of our members to exercise their lawful right to withdraw their labour, to stand up for themselves or disagree with their employer in any way. They have taken on an army of workers on zero hours contracts to undermine this dispute but would, never the less, not hesitate to sack our members if they exercised their right to strike’.